Representative Honours: Ireland: 1 Full Cap (1885). The Hamilton brothers came from fine stock, and were both gifted sportsmen outside of football. Willoughby went on to play tennis with great success, notably winning the Wimbledon Championship in 1890. 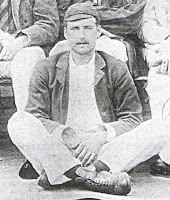 Drummond was a gifted cricketer, playing for Oxford University and Ireland. He also enjoyed some success on the tennis court. Two other brothers would also played cricket with note, Blayney Balfour Hamilton and Francis Cole Lowry Hamilton (winning a Minor Counties Championship with Cheshire). Blayney also excelled at tennis. If you have any further information on the Hamilton brothers, please contact NIFG. Thanks to Roy Cathcart for spotting the photo of Willoughby. The Dublin Association Football Club, for which both brothers played, dispanded in 1890 following controversy in the Irish Cup. Their semi-final match against Cliftonville initially resulted in a 3-2 defeat, but the Dublin-club protested that one of the match officials was a member of Cliftonville. The Irish FA ordered a replay, which Cliftonville duly won 4-2. Again the Dublin Association appealed the result, claiming "hometown" decisions were responsible for their defeat. This time however the IFA refused to intervene and Dublin Association folded, unwilling to accept the dictates of "biased officials". Many of the clubs' players joined the newly formed Leinster Nomads. The following passage on WD Hamilton's cricket career has been kindly supplied by by Ger Siggins, co-author of "Ireland's 100 Cricket Greats "; (by Gerard Siggins & James Fitzgerald, Nonsuch Publishing Ireland, 2007). Drummond Hamilton was one of four members of a prominent family who played for Ireland over a period from 1877 to 1907. His cousin Horace was first to be capped, with a career highlight of 7-15 and 4-78 against I Zingari in 1878. He won eight caps - and broke the Canadian high jump record while on tour with Ireland - but died suddenly while playing billiards aged 36. Drummond was the eldest of three brothers; Rev FCL (Lowry) won four caps from 1888-93 and Blayney (see previous page) 19 from 1891-1907. Drummond's final haul of caps was a modest 14 - Ireland played 36 games in that time but Hamilton was not always available, missing the tours to North America in 1888 and 1892 for example. But he showed enough quality in those 14 games to rank among the best batsmen of the 19th century. He was educated in England at Haileybury, where he was in the first XI in 1876 and 1877. The school yearbook described him as: "A thoroughly good left-handed bat, who always plays the game and hits well to all parts of the field; a capital point." He went up to Queen's College, Oxford and in 1880 made 211 not out against University College. In 1882 he scored 109* against Corpus Christi, and was selected for the University XI. With 53 against the Gentlemen of England under his belt, he played in the Varsity Match at Lord's, but was so nervous that he set off for a run in the wrong direction. He made 9 and 0 for his side which included fellow Irishmen Edward Shaw and Charles Leslie. Returning to Dublin for the holidays he played five games for Leinster and averaged 34. Finished at Oxford, he made 54 for MCC against the university at Lord's in 1883, the year he made his debut for Ireland. Against I Zingari at the Phoenix Park he made 28 and 7 but did not play again for four years. The Canadians visited in 1887 and "with brilliant hitting" made 62 (the first time Ireland made over 300 at home) and 31, while he made another 62 against the Philadelphians in 1889. South Africa toured Britain and Ireland in 1894 on a non-first class basis and he made a classy 68 against them - out of 153 - at Rathmines. His last game for Ireland was in 1896 when he was bowled by Dowson of I Zingari, seven runs short of a century. Wisden described Hamilton as "a fine free left handed hitter and abeautiful field, especially in the long field", and at his peak he stood 5'8" and weighed ten stone. He married Alice, daughter of George Kinahan, who played in Ireland's first international match in1855. Drummond later followed his father to become Rector of the Parish of Taney in Dublin. A soccer player with Dublin Association, he played once for Ireland against Wales in 1885.